Typically the snow arrived in Grain just in time to quash our plan to meet on our usual third Sunday in the month so we were unable to get to work on 20th January as planned however it has been a successful month as shown below. 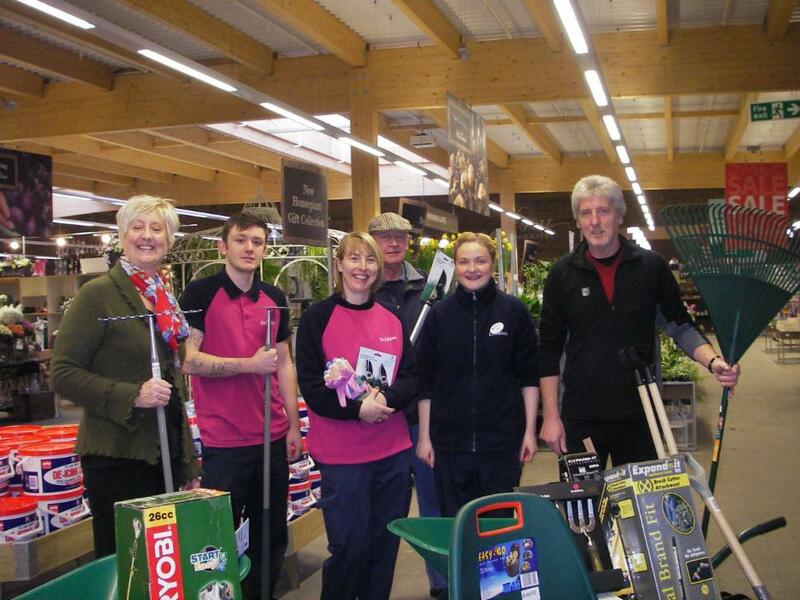 Here is a photo of Jacqie, John and Michael attending Dobbies to collect our £700 worth of free equipment kindly donated by the store. We are eager to get to work with the equipment and look forward to seeing everyone on 17th February 2013. Can we just say a big big thank you for the kind gift by Dobbies of up to £700 for the use by the Friends of the newly formed, Isle of Grain Coastal park. Since work started some two years ago, we have created four new footpaths, and bridlepath, and have now made them Public rights of way, through the Medway Council, named by the children in the village who helped us. We have many other new paths and open mown meadows, all hidden away in this seemingly forgotten village. The park always open to the Public for free 24 hours a day. Large areas of dense bramble has been cleared, with the advice of the Kent Wildlife Trust, an agreed management plan is ongoing, and forming wild and beautiful areas with miles of walks, through woods or shoreline (Two and a half miles of shoreline walks ) The park is a declared an area of special scientific interest, for the very rare Carder Bees , which are now abundant here. There are only five small pockets of these bees in this country, and wild flowers and coastal grasses are also flourishing now due to correct management. A host of butterlflies moths, share the park, with the hidden wild creatures, who have their habitat fully preserved, away from the public eye. We are the only countrypark in Medway, which is not owned by the Medway Council. (It is owned by the Parish Council, all of which are members or support the Friends work) and so without the support of kind people like yourselves, we would not be able to continue to create and maintain such a beautiful park. It also shares the availability of coastal walks, shoreline rocks and cockleshell beaches which the children love, almost hidden but just a 20 minute drive from Medway. If any of your staff would like to visit do please contact one of us via E mail or 01634 270 314, for an escorted walk, alternatively, I can send a map of the paths I also have an alternatively E mai address for the park michael.on.grain@gmail.com or read The friends of the Isle of Grain Coastal Park own website. Your gift of tools will make things so much easier for us, and from now on will be in use all year round. For a fun day out some of you may wish to join the friends on a monthly third Sunday, which not only does a little litter pick, you could instead join the team keeping the paths safe and easy to walk by spreading woodchip from the trailer, or building steps up the slopes. The attachments include the photo we took of your staff presenting our Park Rangers with our gift from Dobbies, and the story of Grain ( scroll down for two pages) which has recently been published for us, extensively across the sea east, courtesy of the Thames Estuary Partnership, of which we are members.